Mark Larson Sensei (Takuto) first learned about Aikido in 1990 at his college. After 17 years of participating in competitive athletics, including ice hockey in the United States Hockey League (North Iowa Huskies, 1989-90) and National Collegiate Athletic Association (Bemidji State University, 1990-92), and explorations of Wing Chun kung fu and Goju-ryu karate, Mark Larson’s studies took him to northern Japan, where, in the fall of 1992, he began Aikido at Akita Aiki Shuren Dojo under the direction of Shigeru Kawabe Shihan. Within 6 months of training, Kawabe Shihan invited Mark to the Hometown/Birthplace of Aikido and Founder’s Dojo (Iwama Dojo) and Aiki Shrine located in Iwama, Ibaraki-ken, in order to introduce him to its chief-instructor and Aiki Shrine caretaker Master Morihiro Saito, 9th Dan Aikikai. Over a period of five years, Larson would spend numerous times as uchideshi (dojo live-in student) between 1993-1997 and again between 2001-2002, at the Founder’s Dojo beneath Saito, commuting from Akita and achieving the status of the last “American Uchideshi” of Morihiro Saito Shihan. From 1997-2001, Mark Sensei did over four years of residential training at the Founder’s Dojo under the auspicious tutelage of Morihiro Saito Shihan, residing in Iwama with his wife and son (b.2000) while working for the Iwama Town Board of Education–receiving an introduction and recommendation from M. Saito Shihan. It was during this 5-year-period of 1997-2002 that Mark Larson served as Morihiro Saito Shihan’s main otomo (personal attendant), primary uke (teaching & training partner/receiver of techniques) and translator, accompanying M. Saito Shihan on numerous occasions all over Japan, to the USA (Denver, CO, and California), and Denmark (Fuglso and Copenhagen). Prior to Larson’s departure from Iwama in 2001, the Iwama Dojo held a Sayonara Party for Mark and his family, then Morihiro Saito Shihan held an additional private ceremony for Mark and family inside the Iwama Dojo where Mark L. Larson was awarded a 5th Dan Iwama Ryu certification and mokuroku/makimono (weapons catalog/handwritten scrolls), receiving the menkyokaiden “license of total transmission”–the highest level of license that exists in the Aiki-ken and Aiki-jo from Master Saito and highest honor bestowed by Morihiro Saito Shihan to only a handful of select students. Larson was authorized at that time by Morihiro Saito Shihan to teach Saito’s weapons curriculum and administer Aiki-ken & Aiki-jo Dan grading/certification. 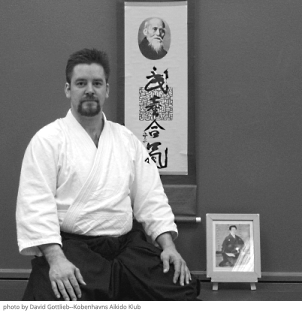 While living in Japan, Mark Larson Sensei participated in Japan’s top Aikido demonstration (Zennippon Aikido Embutaikai), in 1994, 1996, 1997, 1998 (Morihiro Saito Shihan’s uke), 2000, and 2001 (Morihiro Saito Shihan’s uke); performed Aikido in the 6th World Games in 2001 with Morihiro Saito Shihan (as uke for the demonstration and translator for the seminar) as well as demonstrated on his own; and earned Most Valuable Practitioner Honor at the Kashima Shimbuden Air Self-Defense Forces Aikido Gassyuku in 2001. Larson founded the Minnesota State University – Akita, Japan, Aiki Shuren Dojo Aikido Club (aka MSU-A Aikido Club), spring of 1993 – 2004 (renamed by the local prefectural government Akita International University, AIU Aikido Club, 2004 – present). Mark Sensei returned to his home state of Minnesota from Japan in July of 2002 to attend graduate school and open an Aikido Shuren Dojo (August 18, 2002). He demonstrates Aikido worldwide, having taught people between the ages of three and eighty-three, from all walks of life: professional athletes–ice hockey, figure skating, baseball, boxing, MMA, wrestling, and dance; musicians and writers; fire, search & rescue workers; law enforcement and military personnel–police officers, investigators, bounty hunters, self-defense tactics instructors, firearm instructors, SERT snipers, FBI agents, U.S. Department of Homeland Security (TSA), Army Rangers, Navy Seals; as well as other professionals in the educational, corporate, medical, and security fields. Today, Mark Larson Sensei is available for guest speaking engagements, events and instruction. He continues to teach Aikido classes, workshops, leadership sessions, and seminars privately and as a Minnesota State college-level course. He presents locally, nationally, and internationally–traveling throughout North America, South America, Europe, and Asia. He is the founder and chief instructor of Minnesota Aiki Shuren Dojo, Nowthen, MN, and technical advisor for a number of Aikido Dojos in the USA and Japan as well as Canada, Denmark, and Sweden. Larson Sensei currently holds a 6th degree black belt in Aikido (rokudan) from the World Aikido Federation (Aikikai) Headquarters, Tokyo, Japan, led by the current Aikido Doshu Sensei, Moriteru Ueshiba (1951- ), presented to Mark L. Larson on January 13, 2013, at the Hombu Dojo Kagami-biraki ceremony and celebration in Tokyo, Japan.